Samoan Culture - Fa'a Samoa, the Samoan way! Talofa Lava! Ulufale maia i le tatou Fale Tali Malo! 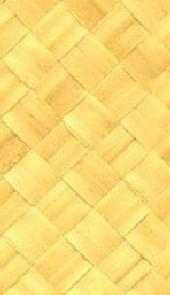 Alala maia, se'i palu le Ava, (the Ava ceremony is in progress), known by many as, KAVA. This traditional ceremony is to welcome any visitor or neighboring village matais. O le Ava e feiloa'i ai malo taua. Here is a sample lyrics from a traditional Ava song and dance. Samoans demonstrate their pride in their culture through the Siva, the Samoan dance. Combine the Siva with rhythmic chants and pulsing island harmony, called pese malie, and a beautiful story is about to unfold. Every Samoan knows it and can spontaneously launch into a smiling, singing rendition at any time. The first American flag was flown over Tutuila on April 17, 1900. Samoans celebrate with a special ceremony. 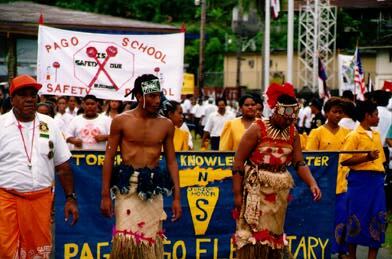 The Flag Day is the biggest holiday in American Samoa. Every year there is at least one day, and some times two or three days, spent honoring the political relationship with the United States and the first raising of the American flag. They raise the flags of the United States, American Samoa, and the Independent state of Samoa. April 17th of the year 2000, the new millennium, will mark the 100th anniversary of American Samoa joining in political union with the United States. SAMOAN BEAUTY - Samoan children Fa'ase'e at the Vai Tafe Beautiful waterfall photos were borrowed from Samoa - Heart of Polynesia site. Special thanks to all Samoan sites on the WWW. 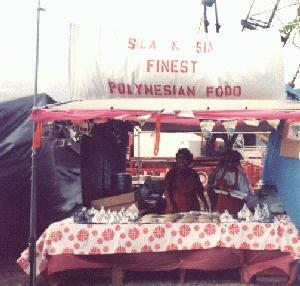 They have brought more insights about our pride in our culture and fa'a Samoa, the Samoan way. This wonderful spirit is shared by all Samoans. Politically, there are two Samoas, culturally, there is only One. Please don't forget to sign our Guestbook to let us know you were here!